Separate yourself from your classmates in Chicago by working as an intern. Internships allow you not only to boost your resume but to also gain valuable real world experience in your field. 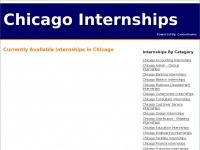 Start your intern job search on chicagointernships.net, powered by CareerRookie. The web server used by Chicagointernships.net is run by Rackspace Hosting and is located in San Antonio, USA. On this web server 95 other websites are hosted. The language of those websites is mostly english. A Apache server hosts the websites of Chicagointernships.net. The website does not specify details about the inclusion of its content in search engines. For this reason the content will be included by search engines.